For each visitor ticket you can add a colorful label with personalized information regarding that particular visitor. Labels function like sticky notes and are visible for all coworkers in Qminder. The language of your visitors. Their reason of visit (what or who they want). Their appearance, so you can approach them on the shop floor. Whether they have shared required documents or info. Labels are a simple-to-use, intuitive tool. If you would like a more data-driven approach, look into Custom Input fields. 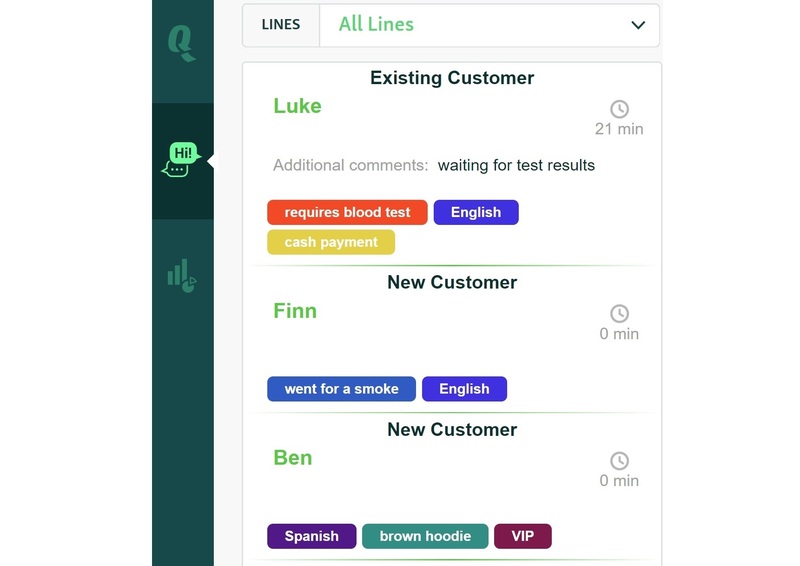 You can add labels in all of the three stages of customer journey. 1. Sign In - You can add labels in the Add Visitor window by typing. 2. Waiting - You can add labels by clicking on the visitor from the queue list. 3. Service - During service you can click on the arrow next to the Call Next button. NB! You can remove labels in the same window where you add them by clicking on them. You can edit and delete labels from the labels list in the settings. Click on the Locations tab on the left hand sidebar and then click on the location which labels you wish to edit. Click on Input Fields and then click on Labels. ADD NEW LABELS by clicking on +NEW LABEL. SEARCH FOR LABELS by typing and filter them by clicking on All Labels. 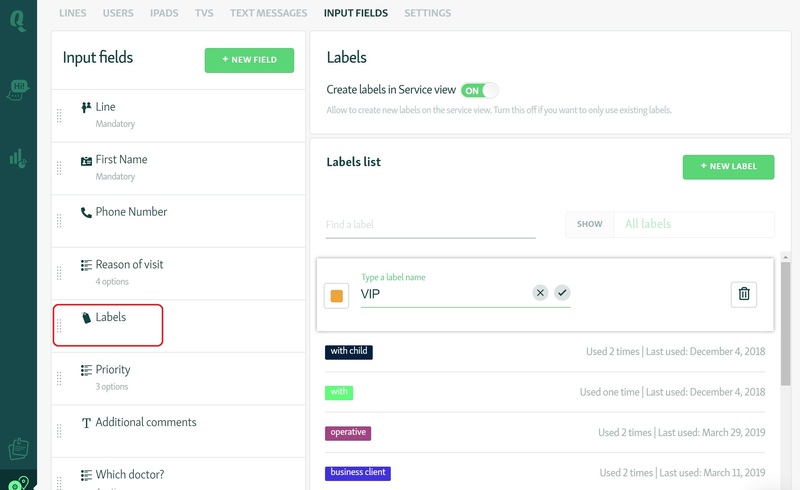 LOCK THE LABELS LIST by turning off Create labels in Service view. This way you can decide if you want to let your clerks add new labels or do you want them to only use the labels that have been pre-created. You can edit existing labels by clicking on them on the list. CHANGE THE LABEL COLOR by clicking on the colored square in front of the label. DELETE A LABEL by clicking on the trash can icon.